Read our Cooper's Cave interview below to learn all about the Owner and Chef, Patty Bethel. What she does, how long she's been doing it, and how she started. 1. Have you lived in the Glens Falls area a long time? All of my 58 years. 2. Where does the name Cooper’s Cave come from? The business is named after the cave made famous by JF Cooper. Our love of local history (we’ve been re-enacting the French & Indian war since the 70s) led us to choose this historic site as our namesake. Our Pub entrance is the shape of the actual Cooper’s Cave. 3. What products do you offer besides beer? How is the food? We produce over 30 types of ales & lagers, 10 gourmet sodas & more than 40 flavors of hard ice cream all in our building. In the Pub we serve traditional pub fare, kicked up a notch. We are famous for our Chopped Salad, Burgers & Wings and specials. We offer 3 different lunch & dinner specials daily. Dinner menu includes Steaks, Ribs, Fish etc. The food & service are consistent. 4. When did you learn to brew beer? We started brewing beer in the kitchen at home in the 80s. Soon after that, we graduated to the garage, and we opened the business in 1999. 5. Which beer is your personal favorite? Personal favorite… you mean today?? She laughs! IPA, also known as Irate Patty’s Ale is my year round favorite. Right now though, the Blind Rock Maibock is killer! 6. Do you bottle beer for distribution? Yes… We bottle our beer in 22 oz. bombers. 7. What do you like to do when you are not at the pub? I’m always at the Pub… except in March. Puerto Rico beckons! 8. What makes Cooper’s Cave different from the other pubs and breweries in the area? We self distribute, we brew only 7bbls at a time, and we make our own Ice Cream in small 5 gallon batches. Our pub has no TVs, no bottled beer and no BS. 9. Do you have any special events coming up? We offer entertainment on the weekends. Jazz every other Saturday, and ‘not-jazz’ every other Friday. 10. 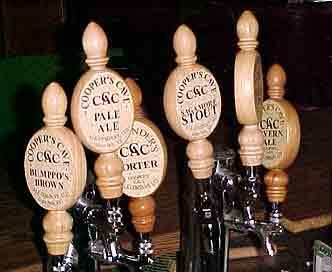 What are some of the hot spots in the area where we can find some Cooper’s Cave Ale? CCAC is available at locally owned establishments including 132 Glen Bistro, Lawrence St. Tavern, Montcalm, Humbuggs, Maxwells, Gourmet Café, Log Jam, etc.